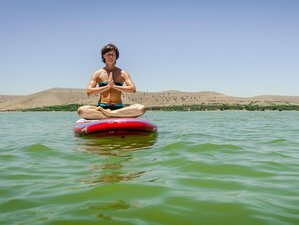 KechEvents freut sich darauf, Ihnen diesen individuellen Yoga und SUP Retreat im Riad Magellan, einem ruhigen Ort im Herzen der Medina (Altstadt) Marrakeschs, anbieten zu können. Auf fast 600m Höhe können Sie still und leise vor allem davonpaddeln und mit unseren Yoga Einheiten eine wahre Oase des Friedens mit einer malerischen Aussicht auf den Hohen Atlas genießen. Riad Magellan is a small boutique-hotel, a peaceful venue still located right in the heart of the old town (Medina) of Marrakesh, with six attractively decorated rooms with private bathroom, a plunge-pool in the courtyard, and a rooftop terrace, offers a truly tranquil and peaceful oasis. It provides escapism from your everyday lives and the setting to truly relax. There are sun loungers, a covered terrace, and several private and open areas to unwind. Free Wi-Fi connection is also available. Classes are suitable for both, beginner to experienced practitioners, as Aicha Barzaghi, originally from New Zealand, teaches in a way that moves through the stages, layers and levels of the body so there is something for everyone to feel and look at. A ride to the Atlas Mountains where you will have the opportunity to paddle, do one yoga session and have lunch at more than 2000 feet altitude. This retreat will take place in Marrakech, Morocco. The venue is located in the heart of the old city, walking distance from all major points of interest. You will be provided with daily juices, brunch, tea time snack, and vegetarian dinner. Verveine (for tea) and water are complimentary. Since the hotel is located right in the heart of the Medina, the old town, allow yourself some time to get lost and soak up the ancient city life. Upon request and at an extra cost, KechEvents can organize Moroccan cuisine cooking classes, wellness treatments in a close-by spa, or shopping itineraries. Also, an excursion in the Atlas area with silent walk can be organized upon request. Massages are available at an additional cost. Please contact KechEvents for details on massages and other optional spa treatments. Please book your flights to Marrakesh Menara Airport (RAK). Transfers from and to Marrakesh Menara Airport (RAK) can be arranged on request. Please contact KechEvents to arrange for the same at an extra cost. Ihre Anzahlung ist vollständig erstattbar, wenn Sie die Buchung bis zu 21 Tage vor der Anreise stornieren. Der Restbetrag ist 7 Tage vor der Ankunft zu zahlen. KechEvents lädt Sie ein endlos zu Lachen, durch Yoga Meditation und Ernährung zu heilen und durch eine spannende Reise zu sich selbst zu finden.